The task of managing portal pages and web content is evolving and in the next release of WebSphere Portal the integration between web content management and portal page management will grow even tighter. Recently I installed WebSphere Portal 8 Beta 3 and dove into my first examination. In the following paragraphs I talk about what I saw and learned during my sortie into this new realm. 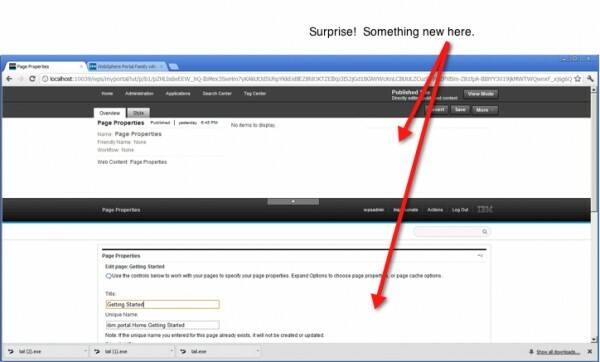 To install WebSphere Portal 8 Beta 3 follow the procedure I described for Beta 2. The updated download links are here and from there you can link to the installation guide I provided here. After logging into the portal I landed on the Getting Started page. I decided to take a quick look at the properties and layout of the page using a conventional approach. I navigated to the Administration pages and loaded the Manage Pages portlet. At the top of the page is a new feature. This pane, which I have dubbed the project pane, represents the state of the page as a member of a project. 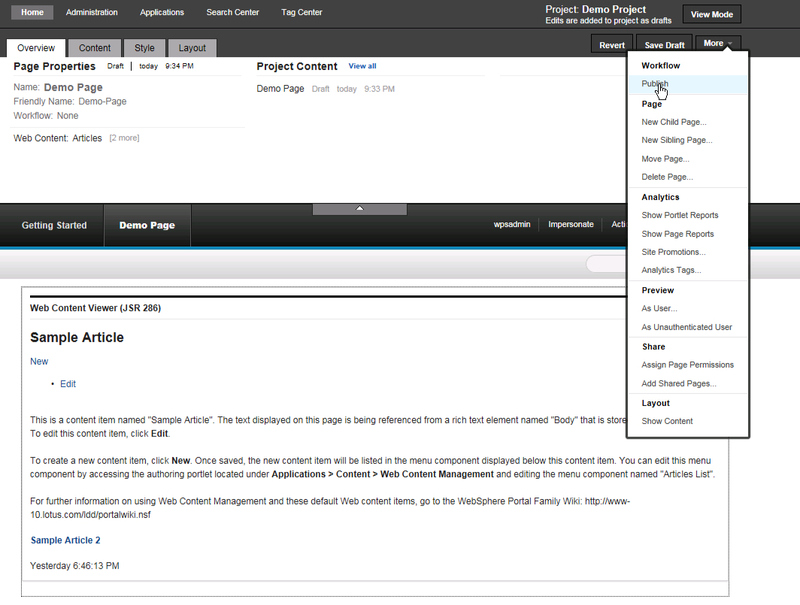 Projects are not new to Web Content Management but they are, so far as I know, new to page management. According to the product Wiki, “When working in a project, any changes you make to a page affect only your view of the page. Returning to the Manage Pages portlet I next selected the Edit Layout portlet. Again a “project pane” and the layout pane appear. By the way, you can collapse the “project pane” to recover more useable space for managing properties or layout. In the layout pane there were not surprises here at all. However, I was a bit disappointed. I realize that this is (1) a beta and (2) the release teams efforts need to be spent on other chores but (3) it would be really nice if the content on the Getting Started Page was web content delivered through the Web Content Viewer portlet and not the “handy dandy” Information Portlet. What next? I decided the best way to get a feel for how managed pages might be experienced would be to create a new project and edit a new page. Returning to the Home tab and the Getting Started Page I placed the page into the Edit Mode. Again, the product Wiki states, “There are several ways to enter edit mode: You can click Edit Mode directly in the user interface. A default project is created, with the project name being based on the page name and the date. You can change the project name later. The first thing to note is that the functionality for creating a page related project will be very familiar to users who have created pages with the Page Builder theme interface. (Figure 2). Working from the Getting Started page I clicked the Edit Mode button. Right away a vital distinction needs to be made between making changes to a published site and making changes to a project that is not yet published. When stated this way the consequences may seem self evident. However, to a user unfamiliar with the interface they might surmise that the changes they make are not immediately visible. If they believe this, they are wrong. In this case I elected to create a new project. The properties of the project are self explanatory and for this exercise I elected to select Manual for the Publish option. I created a new project named Demo Project. Figure 3 provides a before and after comparison of the interface as I moved through the steps to create a new project. You can select view or edit for a project from the project menu. Choosing the View on the Published site and a particular project allows you to see how one compares to another. Only the published site can be seen by the user community. Now that we have an unpublished project I added a page, Demo Page. If you want to follow my experiment, make sure you have an unpublished project and place it in the edit mode as illustrated in the “after” illustration shown in Figure 3 above. 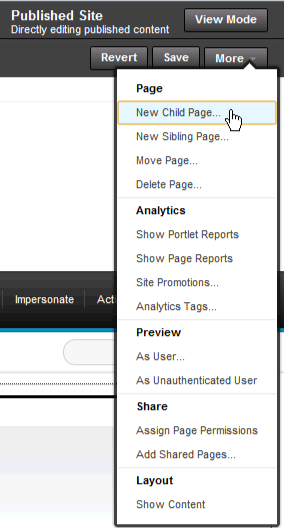 Then, select the More button and choose sibling or child page. I chose sibling to simply illustrating the concept. Figure 4 demonstrates this. 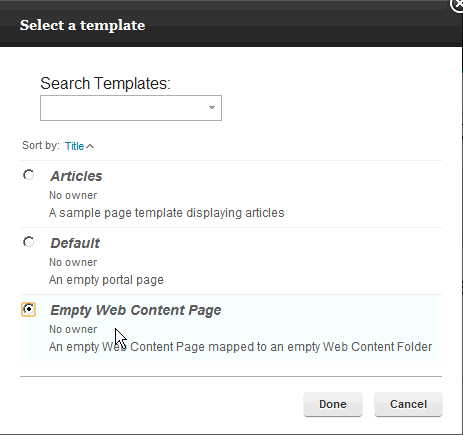 Page creation in the context of a project such as the one illustrated in this topic places management of the portal page artifact into a Web Content Management (WCM) library. This means that “Publishing of projects can be scheduled in the same manner as other traditional WCM components. Additionally, this means that managed pages, as a form of managed content, can be syndicated from an authoring environment to a rendering environment. To my mind this is a huge leap forward in portal site development because it is very plausible that revisions to a site would not only incorporate changes to the content that authors might submit but also pages and related artifacts for presenting content. Syndication does not include propagation of portlets or other web archive (JSP for example) resources. will be interesting to see how these are leveraged in the future as more portal and WCM administrators take advantage of the managed pages feature. See Figure 5 for an example. Once a page and other artifacts are added to a project you will typically refine their properties. Now that we have a page it will be useful to finalize one more aspect of how managed pages work. Keep in mind that the interface seen by our administrator references the published site as well as the projects that are in progress. In our example we have a Demo Project. By alternately clicking the View link for either the project or the published site we can quickly visualize the distinction. Figure 6 illustrates this and in Figure 7 and 8 we show how members of a project are published and, in turn, how the published site is altered. As mentioned, here are screen shots to illustrate HOW an artifact is published. NOTE: It may take several minutes for publish to complete. Be patient! Dose this means that any customized portal page and configuration and layout that is not part of the project cannot be syndicated to another server? The heart of the matter is this, a Managed Page is a WCM resource that is a member of a WCM library. These resources are syndicated. A project is the management tool for working with resources in a draft state So, a customized page, as long as it is a Managed Page that has been published, will be syndicated according to the syndication design you have implemented.